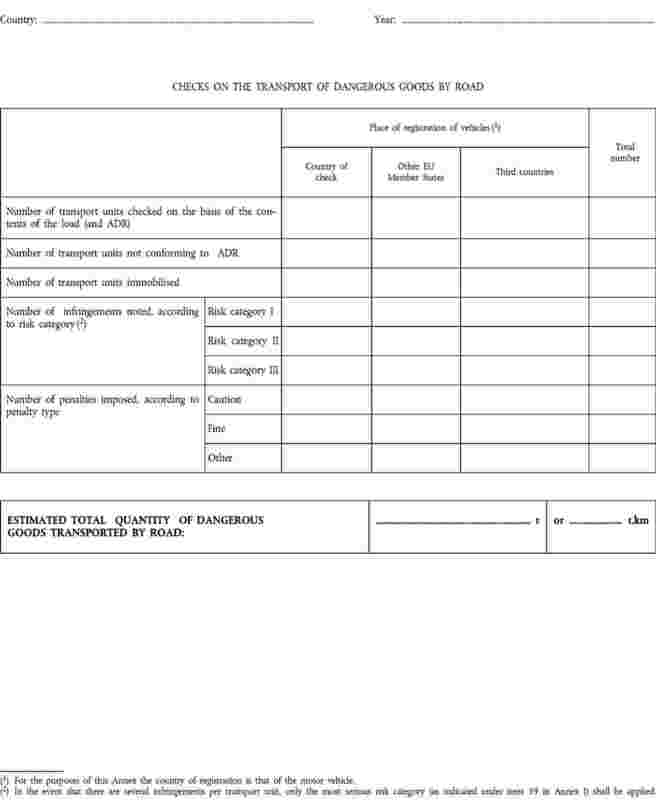 Council Directive 94/55/EC of 21 November 1994 on the approximation of the laws of the Member States with regard to the transport of dangerous goods by road (2) laid down uniform rules for the transportation of dangerous goods in the Community. The Annexes to Directive 95/50/EC are related to the Annexes to Directive 94/55/EC. Adaptation to scientific and technical progress of the Annexes to Directive 94/55/EC may have an effect on the Annexes to Directive 95/50/EC. In order to take into account Commission Directive 2003/28/EC of 7 April 2003 adapting for the fourth time to technical progress Council Directive 94/55/EC on the approximation of the laws of the Member States with regard to the transport of dangerous goods by road, the Annexes to Directive 95/50/EC should be amended. Annexes I, II and III are replaced by Annexes I, II and III to this Directive. 1. Member States shall bring into force the laws, regulations and administrative provisions necessary to comply with this Directive no later than one year after its publication. They shall forthwith communicate to the Commission the text of those provisions and a correlation table between those provisions and this Directive. (1) OJ L 249, 17.10.1995, p. 35. Directive as amended by Directive 2001/26/EC of the European Parliament and of the Council (OJ L 168, 23.6.2001, p. 23). (2) OJ L 319, 12.12.1994, p. 7. Directive as last amended by Commission Directive 2003/28/EC (OJ L 90, 8.4.2003, p. 45). For the purposes of this Directive, the following non-exhaustive list, classified into three risk categories (Category I being the most serious), gives a guideline on what is to be regarded as infringement. The determination of the appropriate risk category must take account of the particular circumstances and be left to the discretion of the enforcing body/officer at the roadside. Failures that are not listed under the risk categories shall be classified according to the descriptions of the categories. In the event there are several infringements per transport unit, only the most serious risk category (as indicated under item 39 in Annex I to this Directive) shall be applied for reporting purposes (Annex III to this Directive). Where failure to comply with relevant ADR provisions creates a high-level risk of death, serious personal injury or significant damage to the environment such failures would normally lead to taking immediate and appropriate corrective measures such as immobilisation of the vehicle. The ban on smoking is not being observed. Where failure to comply with relevant ADR provisions creates a risk of personal injury or damage to the environment such failures would normally lead to taking appropriate corrective measures such as requiring rectification at the site of control if possible and appropriate, but at the completion of the current transport movement at the latest. The vehicle is not properly supervised or parked. Where failure to comply with relevant provisions result in a low level of risk of personal injury or damage to the environment and where appropriate corrective measures do not need to be taken at the roadside but can be addressed at a later date at the undertaking. The training certificate is not on board the vehicle but there is evidence that the driver holds it.